I love dessert. Recently, I had a meeting where I needed to provide lunch. It was also the week of one of our meeting member's birthday, another member was having excellent book sales and I was celebrating finishing content edits on my current WiP. Dessert was merited. But A: it's summer, so something heavy wouldn't do, B: I'm trying to cut back on the baked goods, so I wanted something semi-healthy and C: I had Greek yogurt I bought for smoothies that I needed to use. Brain a racking and parfaits came to mind. 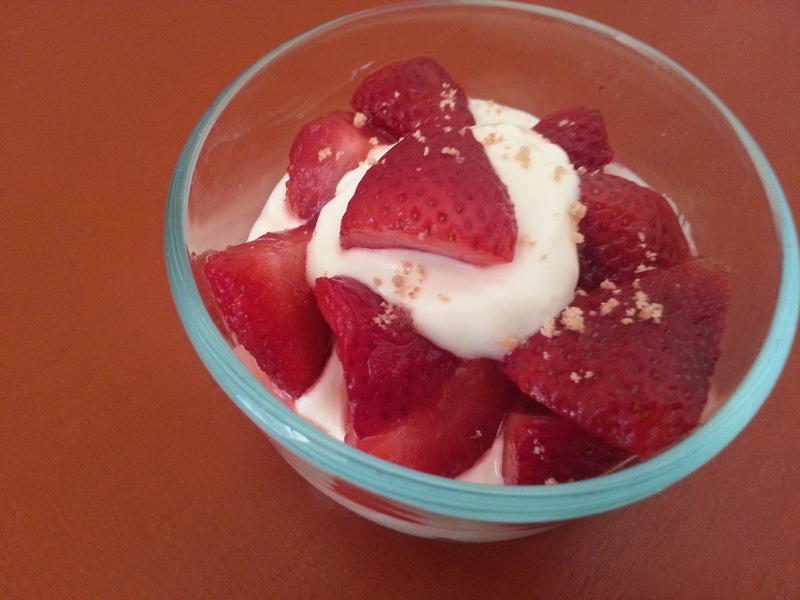 So here is my Greek Yogurt Strawberry Parfait. 1. Take graham cracker and smash with fork in the bottom of the parfait bowl. Drizzle with honey. 2. Spoon in a third of the strawberries. 3. Spoon in half of the yogurt. 4. Spoon in a third of the strawberries. 5. Spoon in rest of yogurt. 6. Finish with rest of strawberries.